Due to some critical bugs that have cropped up during testing as well as technical problems we’re having with the office equipment, the River Creek opening has been pushed back until the weekend. We apologize to those who were waiting at the gate today! We need to be more clear on how the opening will work. So instead of standing at the gate, simply check this blog. We will post here immediately when the region is open. But as a heads up, the regions will most likely be opening in the evening hours. A lot of data has to be updated so we want to do it when they’re not too many people online. Permanent Residents will be receiving a free gift to thank them for their patience. Just so it’s not all bad news, I have some new information to release that answers many of the questions I’ve gotten. - There are two boats. A Row Boat and a Canoe. 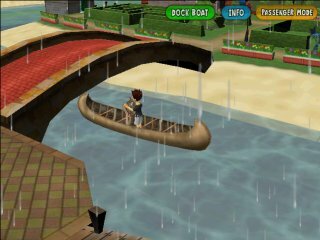 - The Row Boat will cost ~800 SoBucks and you’ll be able to carry one other passenger for a total capacity of two people. - The Canoe will cost ~1500 SoBucks and you’ll be able to carry 4 other passengers for a total capacity of five people! - The cost of gas for Mopeds will drop from 30 SoBucks to 10 SoBucks. Thanks again everyone for their patience! We’re still working on it. I don’t think we’ll get it in by tonight’s update. I’ll post here again tomorrow evening with the status of the new regions. Thanks guys again for your patience. You’ve waited this long for the new regions, a few more days won’t hurt. The final hump of rolling these regions out is taking longer than expected. But you guys won’t be disappointed! Still working on it. We’re planning to start implementing the update tomorrow night and the night after. So if you play SocioTown between 12am - 5am SocioTown time, expect for the game to either be down or have frequent restarts. Thanks. Who hoo! Made good progress and I’m looking to open the region sometime tomorrow (Thursday). The game will probably be down for a couple of hours. Again, just keep an eye on the blog, so you’re not standing around the gate needlessly. Most likely the region will be opening late in the evening, but check the blog for the latest info. So far we’re still on track to begin the final update tonight. I’ll post again in a few hours when the site goes down. Thanks. The game is currently down while we implement the new regions. The game will be back up in a few hours. It’s open!!! I’ll make another post in a little bit providing some additional info. 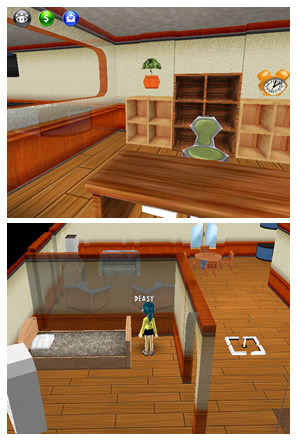 JDLizard’s apartment is small in size, but she included a couple of features that I adore. One is the office space (see image to the left). I have yet to see this in other rooms. The other feature is what she has done to her walls to make it unique. You’ve already seen a preview of fishing in the new regions. But that’s not all that’s new! In the new regions there will also be boats! Boats will offer several benefits. For example, certain areas will only be accessible by boat. Without a boat you won’t be able to reach those areas. 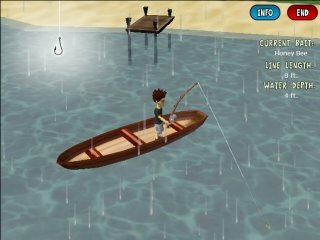 Also, with a boat you can go fishing farther out into the water and get deep sea fish. Hope you enjoyed the preview. The new regions are right around the corner! Congratulations to Jenny0. Way to combine summer and winter clothes. 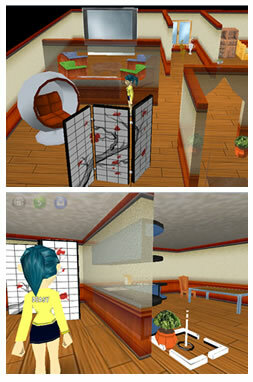 Maggi’s apartment is pretty packed with enough walking spaces allowing you through the different sections. My favorite part of her place has to be the sitting area that seems to be a facade for the theater area also. Overall, a nice place to live. Like I said this video is hilarious albeit a little creepy as well. Excellent use of the SocioTown glitches. Very well done! 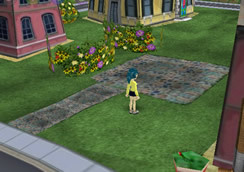 In the 71st issue of the Sociotown Journal, we held a storytelling contest prompting readers to write a short story on the missing building in Sociotown. We’ve now revealed the winner of the contest and the 150 SoBucks to be Vanisher! Congratulations! Your story was truly suberb and entertaining! Long ago there were two neighbouring towns named SocioTown and UnSocioTown. Now in UnSocioTown people didn’t care to help each other out and the island was built on very thin concrete in the middle of the ocean. It was very bland and the terrible service and buildings made it hard to live in. SocioTown was celebrating the first appartment building in the town and UnSocioTown heard about it. They were mad that so many people were leaving there town to go live in SocioTown that the leader of UnSocioTown decided that they would try to copy the building design in order to obtain information of how they can make a better and newer building. The first man never came back from his mission and when they sent another out, he never came back too and every person in the town ended up getting sent out to discover this apart from the owner. He checked the log books and saw that all the other people are living in SocioTown instead of UnSocioTown. This drove the owner mad and after a few years he created a gigantic crane that would stretch out so far you can no longer see it. He said out loud “This is the time that I shall get SocioTown back from stealing my citizens,” and he stretched the crane out over the ocean to the first building ever made in SocioTown and ripped it out of the ground with the big crane. He pulled it back with the crane and just as he was about to drop it, it suddenly smashed into millions of peices and he realised the claw was too powerful and it all landed on the thin concrete, breaking it into peices and the island sank into the ocean and was never seen again. 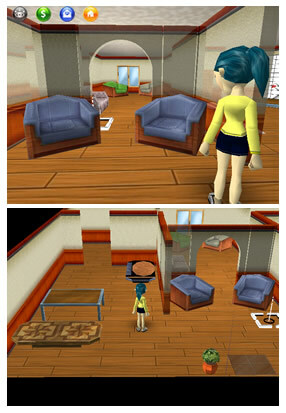 Yinn’s apartment is a work-in-progress it seems but there are a couple of parts in her room that interests me, such as the table section, which includes 3 tables without any chairs in sight, and the sitting hallway, which is a hallway filled with sofas.